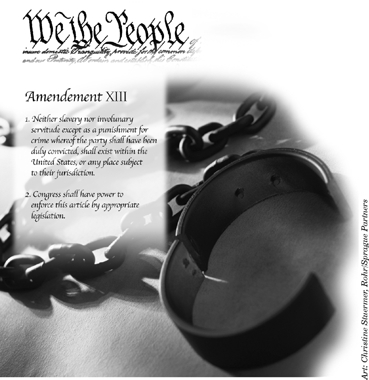 The 13th Amendment | Fight Slavery Now! There was no great movement in America to abolish slavery in the 1780’s, when the Constitutional Convention met. To be sure, there were opponents of slavery on a philosophical level, but the abolition movement did not gather force until the 1830’s, when the American Anti-Slavery Society was founded with William Lloyd Garrison writing the organization’s nascent statement of principles. Prior to the Convention in 1787, many “Founding Fathers” expressed opinions that condemned slavery. The U.S. Constitution and its Bill of Rights contain the rights of a free people, but they do not guarantee freedom explicitly. The Thirteenth Amendment does, albeit with the glaring exception of “for punishment of crime…” Designed to fulfill the promise of the Emancipation Proclamation of 1863, it outlawed slavery, “Neither slavery nor involuntary servitude. . . shall exist within the United States, or any place subject to their jurisdiction” and, by implication, it also established freedom as a fundamental American right. Freedom has had many meanings for Americans, but at its core, the definition has always been set against slavery, the opposite of what freedom promised, which was the liberty to choose and act without coercion or restraints. In 1863, President Abraham Lincoln issued his proclamation abolishing slavery in regions not under Union control, but in fact the document did not free a single slave. Although the Emancipation Proclamation did not end slavery in the nation, it captured the hearts and imagination of millions of Americans and fundamentally transformed the character of the Civil War then raging. After January 1, 1863, every advance of federal troops expanded the domain of freedom. Moreover, the Proclamation announced the acceptance of black men into the Union Army and Navy, enabling the liberated to become liberators. From the first days of the Civil War, slaves had acted to secure their own liberty. The Emancipation Proclamation confirmed their insistence that the war for the Union must become a war for freedom. It added moral force to the Union cause and strengthened the Union both militarily and politically. By the end of the war, almost 200,000 black soldiers and sailors had fought for the Union and freedom. As a milestone along the road to slavery’s final destruction, the Emancipation Proclamation has assumed a place among the great documents of human freedom. Still, at the time Americans recognized its limited effect: the Emancipation Proclamation had no legal status. The Thirteenth Amendment, ratified in December 1865, remedied this problem by making emancipation part of the nation’s fundamental law. Debated then and now was the question of whether the amendment went beyond merely freeing the slaves. Did it promise, in addition, a full measure of freedom for all Americans? Efforts to define freedom began with the European settlement of North America, but the struggle was most fierce during the Civil War and its aftermath of Reconstruction. Until then, Americans usually defined freedom in relationship to the African slavery they knew—slaves were not free, and free men were not slaves. By abolishing slavery, the war destroyed this notion. It also changed the way Americans thought about the Constitution. In the decades leading to the Civil War, the Constitution had become an increasingly sacred text. Americans rarely considered changing it; after the Bill of Rights, it had been amended only twice, the last time in 1804. They especially avoided changing the founding generation’s language on slavery, but the debate over abolition forced Americans to view the framers’ work as imperfect and incomplete. It also provided them an opportunity to build on the founders’ commitment to liberty. In this sense, the adoption of the Thirteenth Amendment represented a transforming moment when the nation redefined freedom and made it part of its fundamental law. Americans were reconstructing the nation to create a more perfect Union and to extend its promise of liberty to all people.